After one of those days, come and join us for a relaxing bevvy and get a free nibble to boot! 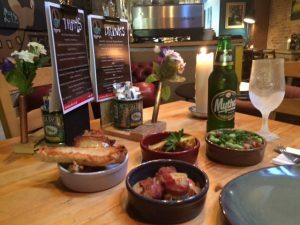 When you order from our Beer, Wine & Cider menu we’ll give you a morsel to accompany it – you know like that clever Spanish lot do! We’ve got a small selection of great wines from around the world (….and Dorset) for you to enjoy. Check out the menus below…..food changes all the time so keep an eye out!